Take a little more transit and eat a little less meat — two things you can do to reduce your impact on the environment. In this installment of Meatless Mondays with Metro, let’s check out veSTATION out in the San Fernando Valley. Photo by Wasana S. via Yelp. veSTATION strives to make healthy food that’s also delicious. The restaurant serves vegan and vegetarian Asian fusion food, although I would say it’s mainly Thai-style dishes. For example, they have pad see ew but it comes with kale and scrambled bean curd. And even though I’m no fan of kale, I can appreciate a healthier version of pad see ew. 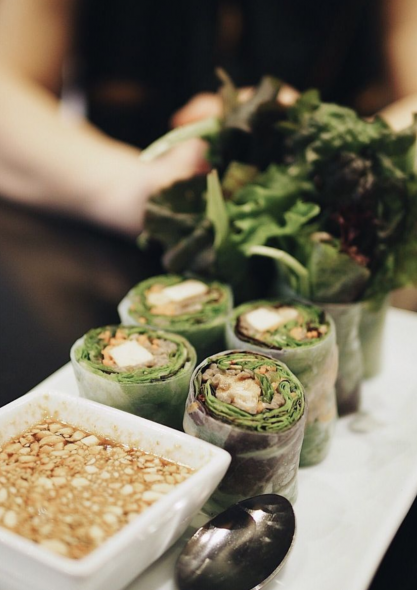 The Buddha wrap is a very popular starter — it consists of an organic garden salad, fresh herbs, organic buckwheat noodles, and lemongrass tofu in a rice wrap, accompanied by an aromatic dip — and you should definitely try the soy satay. They also have a good selection of fresh salads that are hearty enough to fill you up. Many of their dishes come with additional veggies mixed in! To get to veSTATION, take Metro Bus 155 to Moorpark/Van Nuys. Metro Rapid 744 also stops nearby at Van Nuys/Ventura. Why is Metro trying to push an agenda? Why not highlight other restaurants that are near transit lines? Why just vegan restaurants? Check out Vinh Loi Tofu in Reseda. According to LAWeekly, it is one of the five great vegan restaurants in San Fernando Valley. Here’s the address: 18625 Sherman Way #101, Reseda, CA 91335. You can take Metro Lines 162/163 to Sherman Way/Amigo or Lines 240/744 to Reseda/Sherman Way and walk west 3 blocks. Go vegan cuisine, go Metro!